Manama, Oct. 9 (BNA): Bahraini and Saudi Business women agreed to strengthen their regional grouping as a platform for cooperation in the economy. Participants at the forum on the "The role of women in promoting Bahraini-Saudi economic cooperation" discussed ways that economic cooperation between Bahraini and Saudi Business Women can promote trade achieving 2030 Agendas and keeping abreast of this cooperation with major anticipated projects such as King Hamas Causeway. The participants called on Bahraini-Saudi business leaders to take advantage of the huge opportunities for growth in sectors such as training, franchises, tourism and hospitality, as well as traditional economic sectors such as fashion, food, health and beauty. They stressed that business opportunities are available to Bahraini women and their Saudi counterparts in equal terms with men, pointing to the importance of women's initiative to take advantage of these opportunities. They said initiatives such as establishing cheap airlines between Manama and Riyadh and increasing the promotion of Bahrain in Saudi Arabia, Enhances investment opportunities between the two countries and positively reflects both men and women entrepreneurs. Moreover, participants pointed out that women entrepreneurs are essential partners in achieving Bahrain's and Saudi Arabia's efforts to achieve sustainable national development, diversifying national income sources away from oil, stimulating the private sector and supporting SMEs to enhance their export and employment capabilities. Speaking at the opening of the forum Chairman of Alwane Bahrain Mr Ammar Awachi, said that moving forward with the development of economic cooperation with Saudi Arabia, the first trading partner of Bahrain, requires more activism for the role of women entrepreneurs in each of the two countries. "Today we are looking to strengthen the presence of women in the growing economic activity between the two countries and how women can play a key and perhaps leading role,"
Therefore, he stressed the keenness of Bahraini institutions like Supreme Council for Women and the Tamkeen Labour Fund to support Bahraini women. 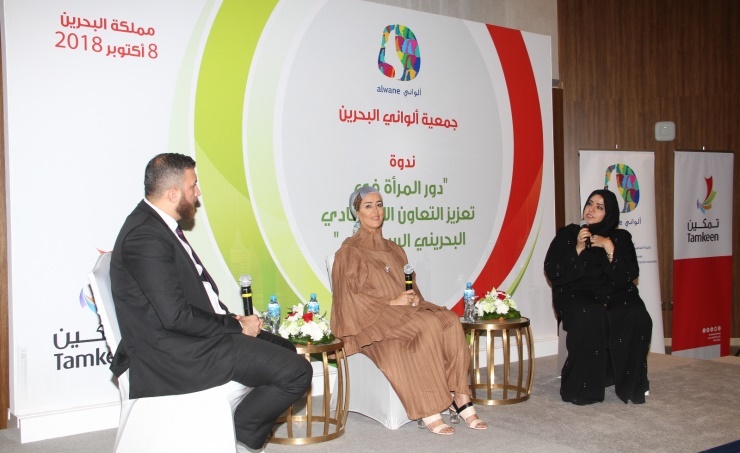 Awachi pointed out that Alwane Society, which is concerned with the economic empowerment of women finds that this seminar is very important in exploring employment opportunities and development for Bahraini women in the Saudi market. "We believe that partnership must be fruitful and mutually beneficial so that it can continue to grow and flourish," he said. He pointed out that the Society will work on formulating the important recommendations that came out of the symposium and presenting them as a road map that can be addressed by officials and stakeholders in Bahrain and Saudi Arabia in order to benefit from them in achieving the goal that we collectively seek to enhance women's abilities and increase their contribution to the development and prosperity of their country. For her part, Ms. Ishraq Mohammed Ubaid, Head of Economic Affairs at the Saudi Embassy, stressed that The Kingdom of Saudi Arabia believes in the role of women and. It sought social, political and economic empowerment, provided a safe environment and provided services to facilitate its duties. She said," Saudi Arabia is now implementing plans in the field of restructuring and implementation of policies of resettlement and optimal market for labor, and promote the participation of women in the labor market and the gradual removal of migrant workers, and contributed to the desire of the female component to prove the presence on the scene." In her speech at the seminar, Ubaid said that it is clear that allowing women to drive will significantly contribute to enhancing their role in the economic cooperation between Saudi Arabia and Bahrain in terms of their ability to move and to review the most important commercial activities in the two countries through several channels, Seminars and meetings of the chambers of commerce of the two countries. She explained that the KSA Embassy in Bahrain is interested to hold meetings and forums for Saudi and Bahraini businesswomen to exchange experiences and know the available job opportunities, facilitate the participation of the private sector in trade exhibitions between the two countries and enhance cooperation in the field of training and exchange of experiences. And encourage cooperation between the Chamber of Commerce of the two countries to explore business opportunities for women and entrepreneurs. In this context, Ms. Obaid stressed her keenness to coordinate with Bahrain Association of Companies to arrange the participation of Bahraini businesswomen and businesswomen at the Saudi International Trade Excellence Fair from 4 to 6 February 2019 in Riyadh. Most important in Saudi Arabia and the Arabian Gulf for franchise owners wishing to grow locally, regionally and globally in the Saudi market. Speakers at the forum were Bahraini businesswoman Jameela Al Shammari and her Bahraini counterpart Huda Janahi. The seminar was moderated by Bahraini entrepreneur Khalil Al-Qahiri and supported by Tamkeen Labor Fund.